Yesterday morning I got a frantic call from one of my neighbors saying that there was a Box Turtle stuck in the window well under her deck and she couldn’t get it out. She had called several places but no one had returned her call and she had no idea how long it had been in there. Please come and help! I couldn’t go so I sent Phil to the rescue. When she had gone down in the basement that morning, she heard a light tapping sound. She thought it was the vent from the dryer but it kept tapping and it wasn’t near the dryer. 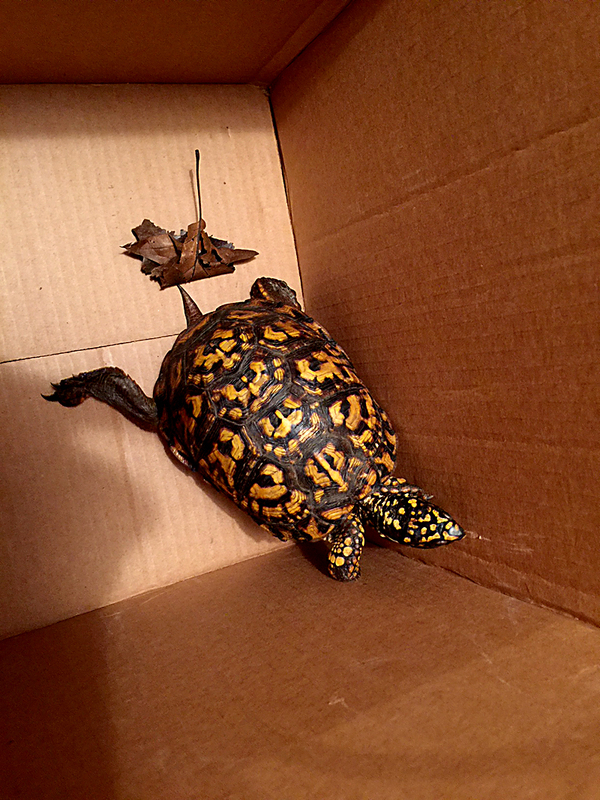 She looked around and there was a beautiful Box Turtle stuck in her window well, tapping on the window, but the window well was under the deck so she couldn’t get to it from outside. She and Phil got the built-up sand out of the window track and were finally able to open it. Phil reached in with his gloves on while Wendy held the box. He was able to place the turtle in the box. They then brought it outside and released it where Wendy had seen some turtle nests in her yard a while back. 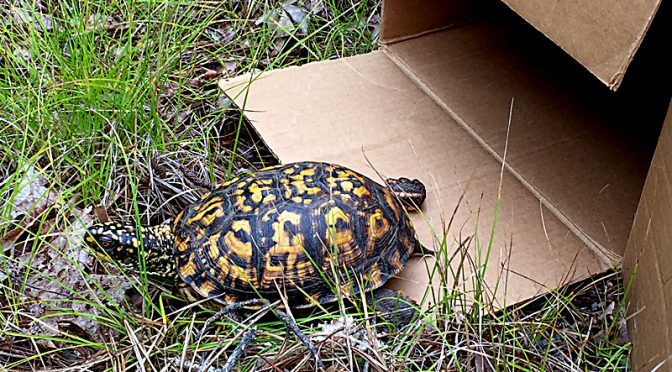 Kudos to Wendy and Phil for saving this beautiful turtle! We looked out the window the other morning and caught a bit of movement in the yard. But it blended in so well to the background of wood chips. 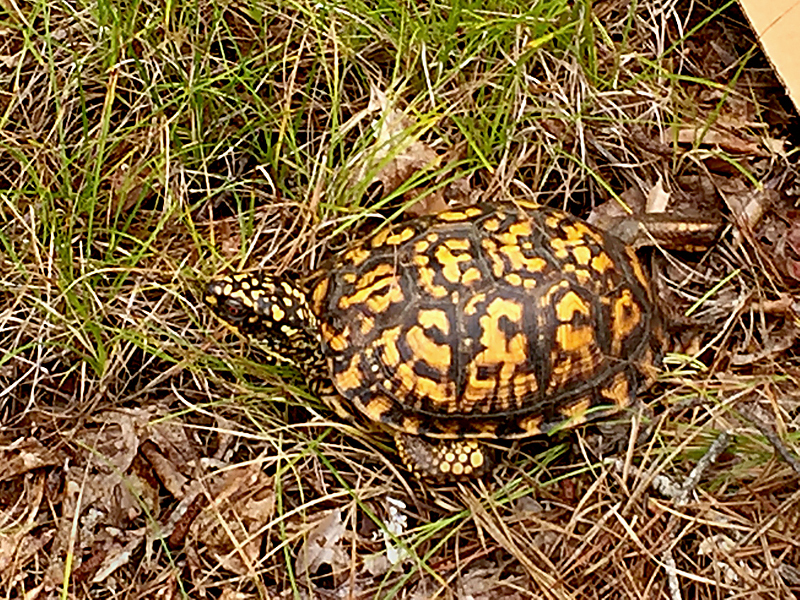 And there was a Common Box Turtle sauntering across our yard, headed for the woods across the way. 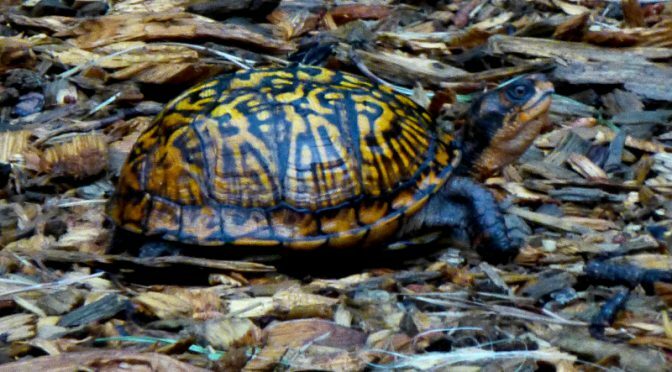 A Common Box Turtle is a little more than 5″ with a high-domed shell. It is dark brown with intricate, variable orange and yellow patterns. It loves to live in the woods and meadows. Our neighbors have talked about Box Turtles in our neighborhood, so they will be so excited to see this new one! Beautiful coloring, don’t you think?